It's one of my worst possible nightmares. You know the one. Where you lose your phone while out on the town. Or, worse yet, you drop it on cold, hard pavement, shattering the screen into thousands of little pieces. My heart is racing just writing about it. You see, I have practically my entire life on my phone. It's my wallet, my GPS, my social network, my phone book, my email, my entertainment, my notepad, my activity tracker, my photos, my memories. In short, it's my trusty sidekick and I could never live without it. 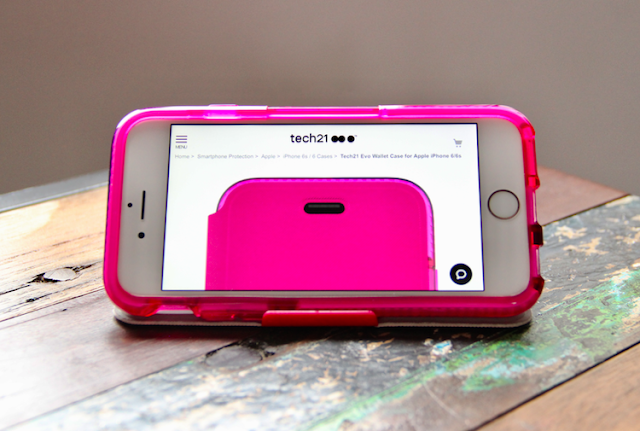 For this reason, I am very thankful to be testing out the Evo Wallet Case by Tech21. 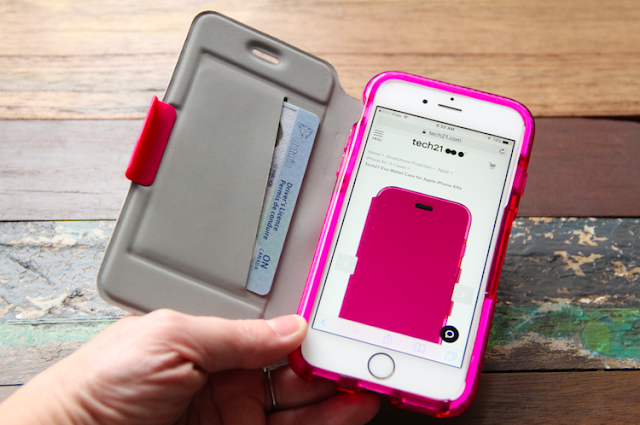 Designed for the iPhone 6 and 6S, the Evo Wallet Case has a flip-over screen cover with a nifty credit card slot. I use it to store my driver's license since I already have a couple of payment cards on my iPhone, which means I could technically leave the house with a small purse or none at all. Last year, I had purchased a similar case from a random booth at the mall because I liked the convenience of storing cards with my phone. Plus, I thought it was a bargain. A couple of months later, it fell apart. The Evo Wallet, however, was clearly built to last and withstand everyday use. Its 'Snap-On' design ensures optimal fit and the FlexShock feature offers advanced impact protection from drops of up to 2 metres. 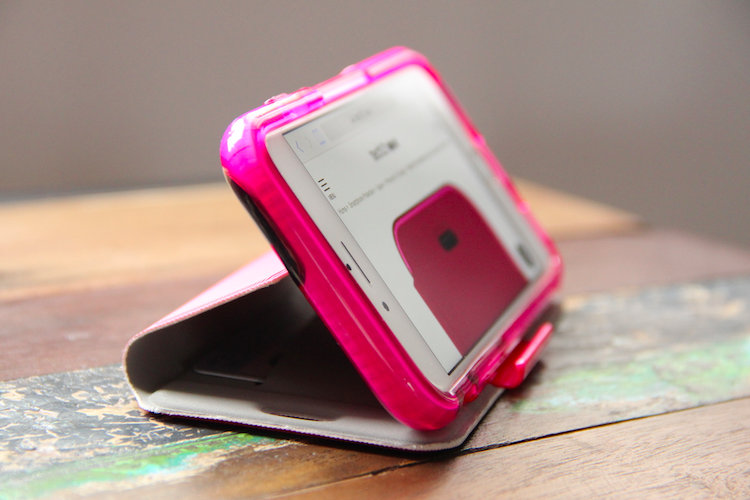 The flip-over screen cover has a soft microfibre lining that adds comfort and style. It can be used for landscape tabletop viewing and easily locks into place when your phone is not in use, providing additional screen protection. Although, I do wish it were easier to flip open with one hand and that it had a smart cover so I wouldn't have to manually turn my phone on and off. With that said, the Evo Wallet Case is a solid accessory for the iPhone 6 and 6S that offers excellent impact protection, sleek design and convenience. I particularly love that it is ultra thin and lightweight. I have never noticed a case that interfered with Wi-Fi and such, but Tech21 uses FlexShock technology that guarantees zero interference with Wi-Fi, signal quality or sensors. And, as an added bonus, it comes with a lifetime case warranty. The Evo Wallet Case currently retails for $44.95 and shipping is free. 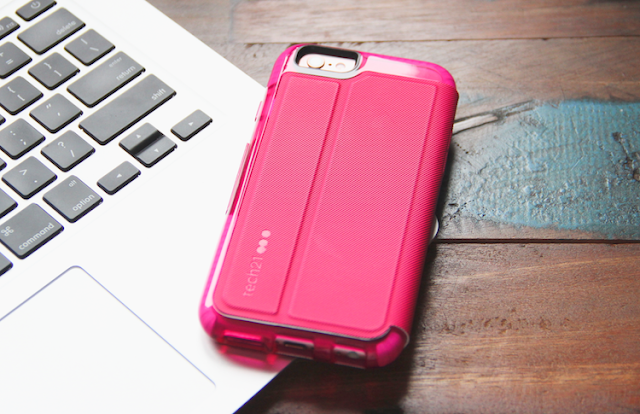 To view the vast collection of cases for mobile devices, including their new Evo Aqua Case that provides water and drop protection, visit tech21.com. Very cute little case, I love it! Ooo the card slots is so handy!